Whoo hoo!!!! I think I’m back on track with getting up at 4 in the morning. Now I just need to figure out how to get up and get moving to hit the pavement at 5 in the morning 🙂 . Well, Monday started out very promising. I was looking forward to meeting my BGR! Columbia sole sistahs at the Summit Library at 5 am. Alarm went off, I woke up…checked the group page on Facebook and the group run was CANCELED due to rain. Time to initiate plan B…..
My plan B for that morning was to just roll back over and get another hour (if not more) of sleep. The bed had been feeling extremely comfy lately and I just didn’t want to get out of it. As always, I just figured I could get a run in later…well it rained on and off all day. That was okay…I just shifted my plan forward a day (no biggie…right?). On Tuesday morning, I had no problem with getting up. In fact I got up a little earlier to head out before the 5 am meet with BGR! Columbia. 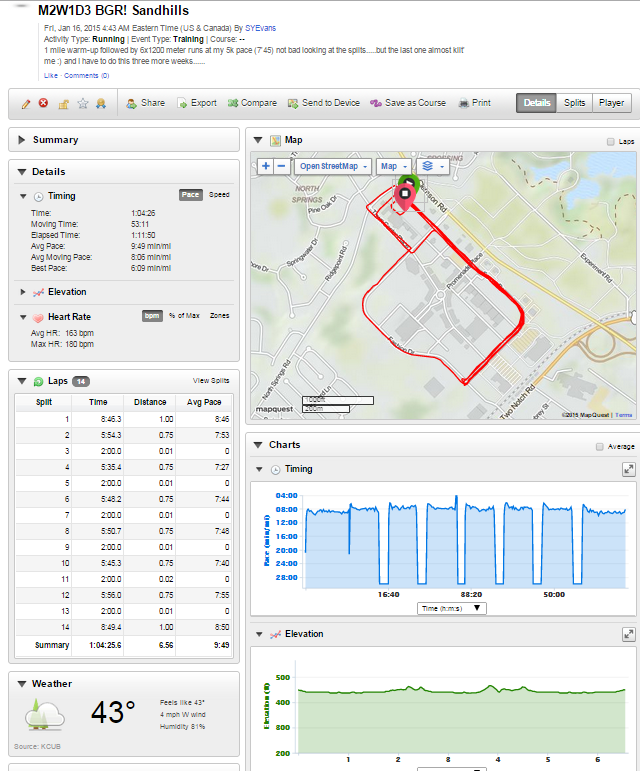 My training plan called for an easy six mile run at my CP. As you know by now, I really have that pace down. This run was coupled with great company and great weather. We got in between 3-6 miles that morning. I’m not quite sure what happened on Wednesday. I know my alarm went off but for some reason I just laid there. I figured (yeah I need to stop figuring) that I would just run later in the day. Got home from work and just chilled with my son. I showed him how to cook dinner but for some reason I didn’t go out to run. Go figure, I just used this as my rest day for the week 🙂 . Thursday, alarm went off…I jumped up and got dressed and was headed out the door twenty minutes later. 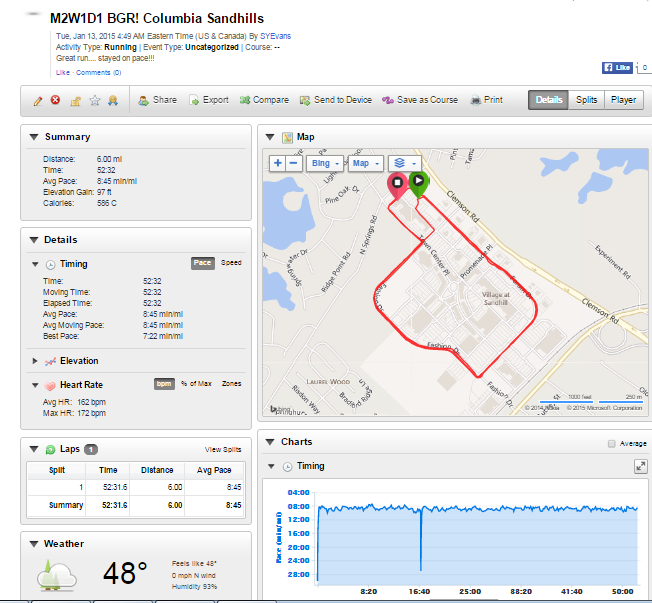 Went to Sandhills and did my repeats. 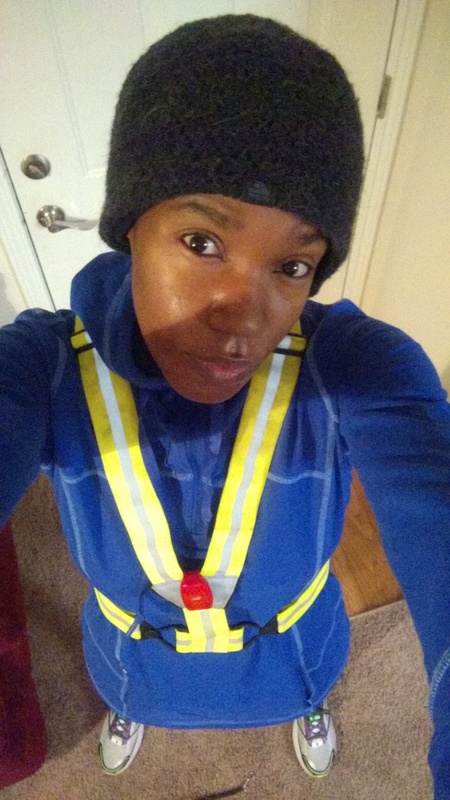 My running coach switched it up on me this cycle. 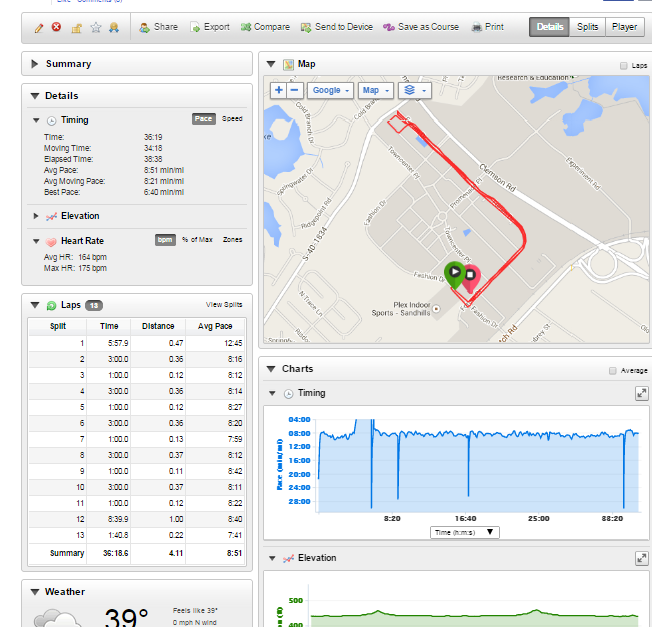 I started with a one mile warm-up at my CP followed by five repeats of the following: 3 mins at 8’15 and 1 min at 8’45. I started with my warm-up but half way through my satellite wasn’t picking up (so of course my pace was all jacked up) and somehow I messed around and hit lap (which ended that portion of my workout). But I did manage to get through my repeats without any issues and finished my run with a one mile cool down. Friday, I met up with BGR! 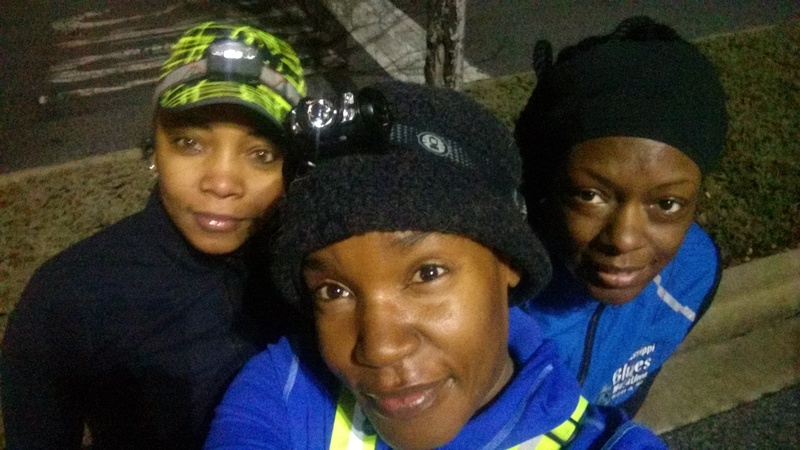 Columbia sole sistahs, Renita and Brenda, to hit the streets for 3-6.5 miles. 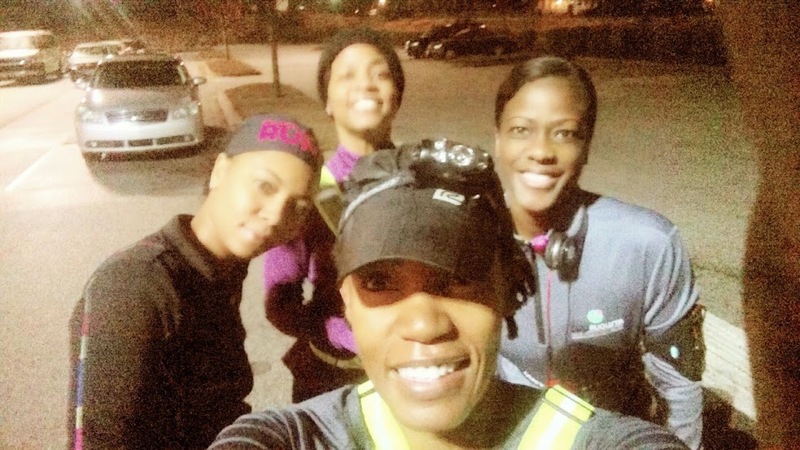 Brenda, Renita and I ready to pound the pavement. 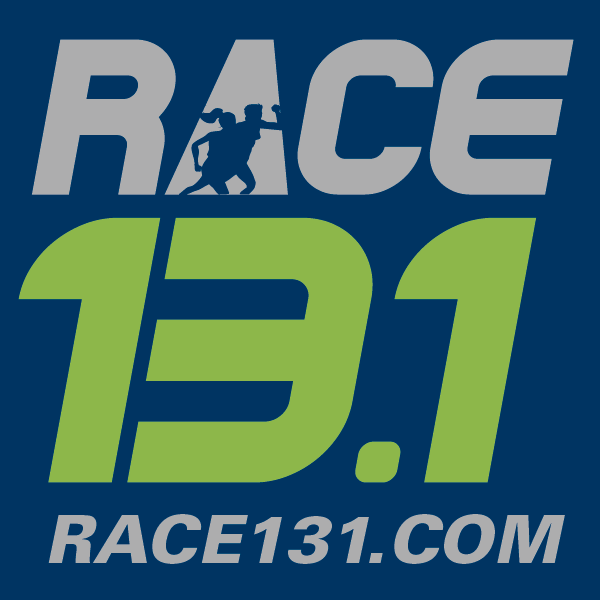 Once again I started earlier because I had to do 6×1200 meter runs at my 5K pace (7’45). I started out really good doing these for 1200 meters, but man I tell you that last one almost broke me down. I think the biggest highlight of this week was finally getting to run with Team Red, White, Blue (RWB). 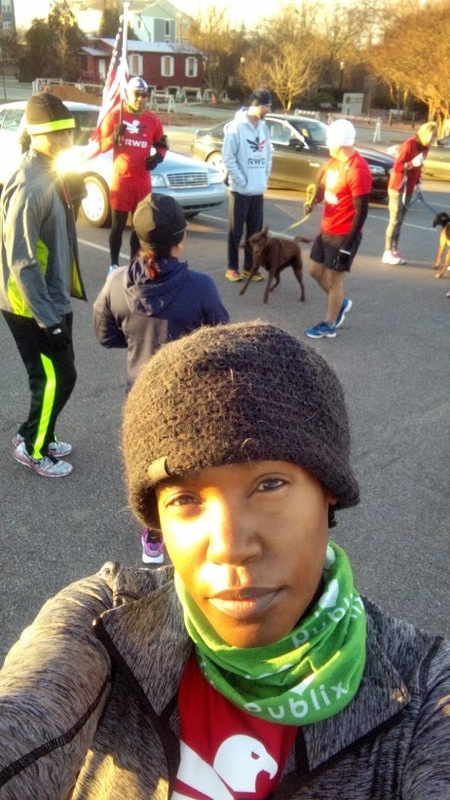 I had been looking forward to running with the group every since I joined in December (remember, I learned about the group at the Lexington Half…click here for recap). The group normally meets every Saturday for a few miles (which I haven’t been able to join because I usually go long on Saturdays) at the Riverfront. And since my training plan days were shifted by a day, I was able to finally head out and meet up with them YAY!!! 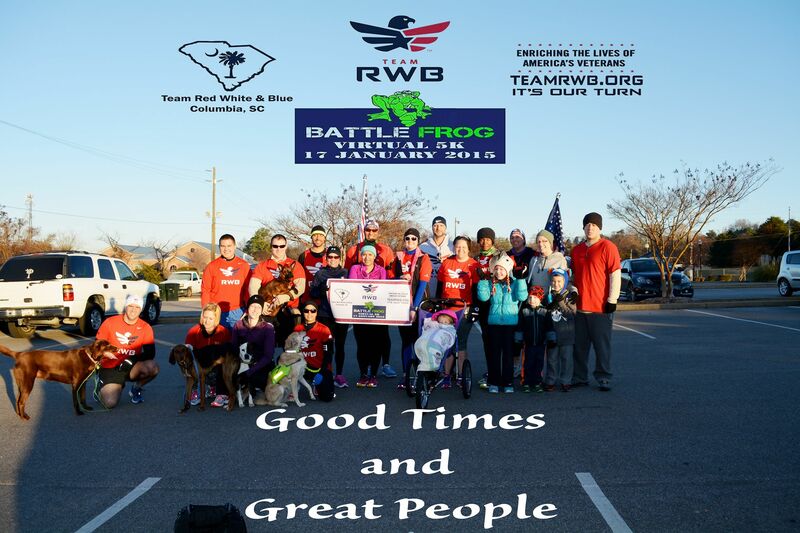 Some of the members were doing the Battle Frog Virtual 5k. It was awesome meeting some of the team! Looking forward to our next meet. This week I ended up making a lot of adjustments to my training plan. I didn’t get my long run in of 10 miles and I didn’t get on the bike. It’s not the end of the world…I will just make sure I do better this coming week. I had planned on doing my long run today but my watch wasn’t charged (go figure) and I need to be able to keep track of my pace (I know it’s weird but it’s my crutch). 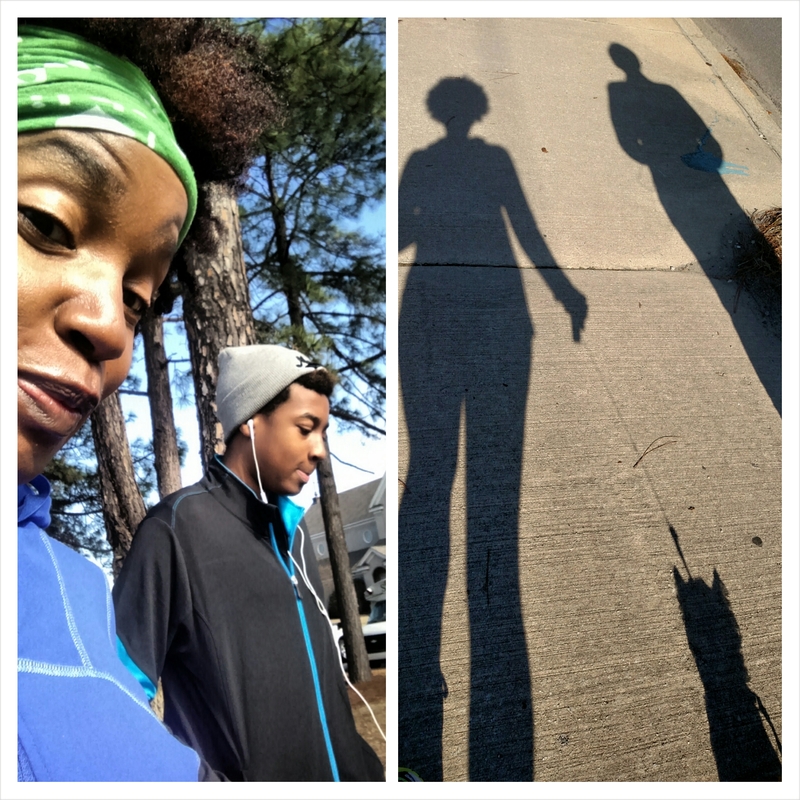 But I did get in a nice walk in with my man child and four legged baby. It was really great just being outside enjoying the weather with these two. Non-running new: I’m still doing my detox and man I tell you I feel great overall (will talk about it in a later post). I have also tried a lot of different raw recipes and may have to incorporate eating raw at least once or twice a week. 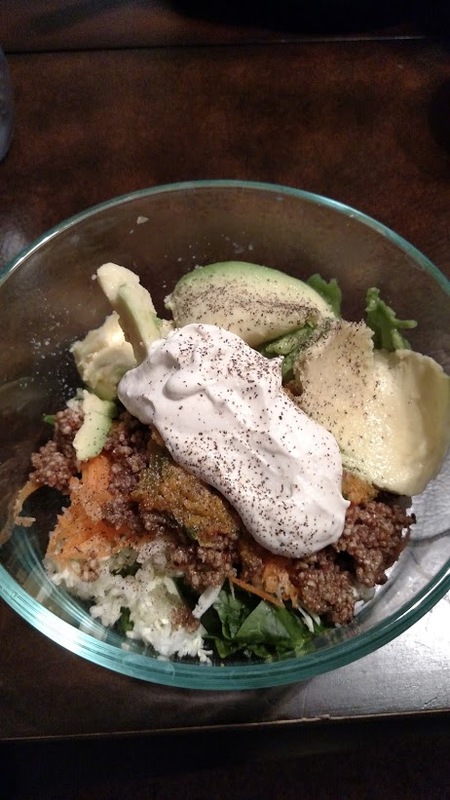 My favorite so far has been raw taco salad with mock sour cream (YUMMY). I didn’t have any walnuts on hand so I used pecans. Even with the pecans it was delicious (recipe here). 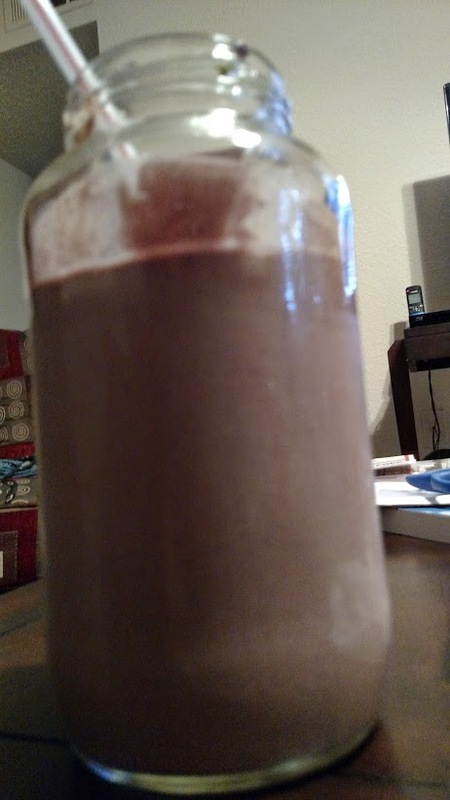 Oh and let me not forget the mudslide (recipe here) that taste just like a malt milkshake…YUMMY!!! Previous Article Week 4 Pains, Gains, Detox and Chocolate Bites!! !